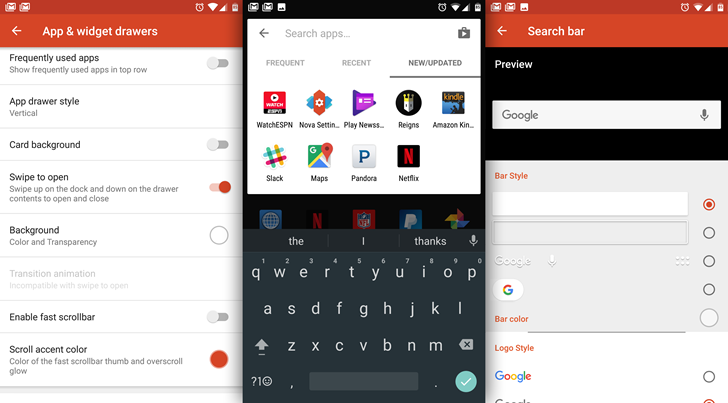 Nova Launcher remains the go-to alternative launcher for power users, customization fanatics, and plain old everyday Android fans. The developer continues to iterate the app with a ton of new features and options, and the full version bump to 5.0 is all about emulating the look of Google's official (and so far unannounced) Pixel launcher. It's available in beta form now from the Play Store program, but the developer also makes the updated APK available as a direct download. For my money the coolest new feature is in app searching, which is now split into three different tabs for more quickly parsing through the apps on your phone without manually setting up drawer folders. The developer recommends a few settings if you want to emulate the Pixel launcher completely: enable swipe to open the dock, disable the card background and set the background color to white, set page indicators to lines, and set the dock background as a white transparent rectangle behind the navigation bar. All that said, none of the new additions really affect the core functionality of the already-solid launcher (with the possible exception of Nougat users), so don't be in too much of a hurry to try the latest version if you're already happy with Nova.